News that the Alberta government is bolstering a royalty credit program to encourage the building of new petrochemical projects is welcome but it isn't expected to help oil and gas producers receiving low commodity prices, industry leaders say. Volumes that would be needed to supply a petrochemical plant would be too low to make much difference in the glut of oil and gas that is hurting prices in Alberta, said Tim McMillan, CEO of the Canadian Association of Petroleum Producers. "On a volumes basis, it isn't particularly large when we're looking to address our market access issues," he said on Tuesday. "We look at what's the volume of gas that these projects will utilize or what's the volume of crude. It's smaller substantially than an LNG (liquefied natural gas) facility or a pipeline project -- by a fair margin." Any addition of demand in Alberta for natural gas is good news, said Gary Leach, who recently retired as president of the Explorers and Producers Association of Canada, noting Alberta faces tough competition in its traditional gas markets in the U.S. and Eastern Canada. But he agreed the program doesn't help with oil price issues, which he blames on "government policy failures in Canada" that have stalled needed export pipeline projects. Premier Rachel Notley announced Tuesday the province is adding $600 million to take to $1.1 billion a second round of future royalty credits through its petrochemicals diversification program. "I'll fight the pipeline battle until it is done. You can count on that," she said Tuesday in a speech to the Rural Municipalities of Alberta. "But at the same time, I have determined that we must take greater control of our own economic destiny." In the first round of the program in 2016, the government selected Pembina Pipeline and Inter Pipeline to be eligible for $500 million in credits. Inter Pipeline is going ahead with a $3.5-billion propane dehydrogenation and polypropylene project to produce plastic pellets and Pembina is contemplating building a similar facility for about $4 billion, with both sites located east of Edmonton. 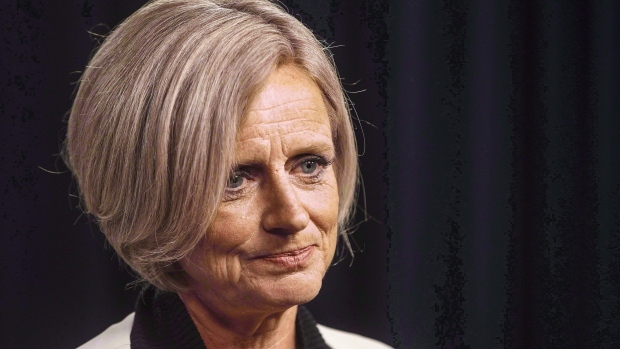 Notley announced Monday she has appointed three experts to work with the energy industry to find ways to close the oil price gap that the government says is costing the Canadian economy $80 million every day, a move that McMillan applauded. Bitumen-blend heavy oil from Alberta has been selling for about US$45 a barrel less than New York-traded benchmark West Texas Intermediate. Notley says the province has received 23 applications for proposed petrochemical projects.